What do you think is the greatest predictor of happiness for your children? Could it be having a stable home, loving parents, enough food to eat, fun activities, experiencing success in school or sports? Certainly these things and many more affect your children's happiness. But what is the best predictor of happiness? In his book, Brain Rules for Babies, Dr. John Medina reports "The greatest predictor of happiness is having friends." Friends really are that important. While you can't control how your children and their friends interact, you can help your child develop key friendship skills. One of the most heartbreaking things is to see your child struggling to make and keep friends. Your child might be shy and easily ignored by other kids, overly sensitive, intimidating other children, or be the vulnerable child who is continually being picked on. 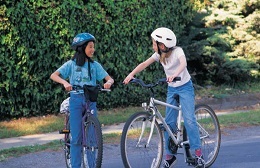 What can you do to help your child develop the skills needed to make good friends?